LASIK surgery is a life-changing procedure that may reduace or eliminate your need for corrective eyewear. At ReVision, we help patients prepare for LASIK procedures and recover afterwards. 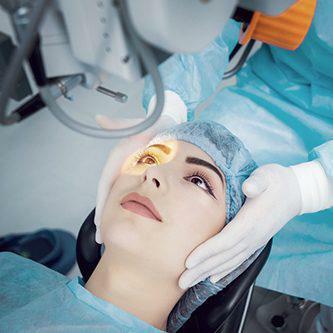 Our goal is to make sure refractive surgery is right for you, prevent complications as you recover, and maximize the results of your corrective surgery. LASIK is an effective and convenient option for many patients, but we must rule out risks and measure your eyes to make sure it’s a good choice for you. Our optometrists, perform thorough eye evaluations that tell us about your eyesight, eye health, and the shape and size of your eyes. We also ask questions about your overall medical history, including eye conditions and other factors that could affect the outcome of your procedure. If your eyes are healthy enough and your corneas are thick enough, your doctor will give his seal of medical approval. This evaluation is a very important step in your path toward better vision, because it allows us to identify potential risks and personalize a plan for your pre-op and post-op eye care. If your eye doctor finds that you’re a good candidate for LASIK surgery, he will discuss your options with you and issue a referral to a trusted LASIK surgery center. We don’t perform the surgery at ReVision, but we do work closely with a local center that accepts many of our referred patients. You will undergo additional testing at the center, including diagnostic screenings and vision tests that confirm your eligibility. Your LASIK team will not proceed with the surgery unless they’re sure it’s right for you. They may discuss more than one surgical option with you, so ask questions and make sure you know exactly what to expect. You will be responsible for following all pre-op and post-op eye care instructions, which your eye care providers will outline in detail. After your surgery, we will continue to meet with you regularly to make sure you’re healing properly and help you minimize complications. Your post-operative follow-ups will start just a day after your LASIK surgery. At this initial post-op eye care appointment, we will discuss our recommendations for the months ahead, including prescription eye drops you may administer at home and multiple eye exams over the next six months. One year after your LASIK surgery, come back to ReVision for your full eye exam. During this comprehensive evaluation, we will assess your progress and finally confirm the long-term results of your procedure. We will test your vision and eye health, ask questions about your post-op eye care regimen, and change your corrective vision plan according to the post-op condition of your eyes. If you’re interested in LASIK surgery call us today to schedule your pre-LASIK evaluation.